Tic-Tac-Toe seems to be the challenge du jour – or shall I say ‘du semaine’?! This week, Penny has put together a great Tic-Tac-Toe for you; remember you only have to choose 1 line; either horizontal, vertical or diagonal, and use those 3 items on your project. I used one of my favourite birthday sets – Party With Cake, and the retired It’s My Party Designer Series Paper (it was from the Spring Occasions catalogue). I love this paper, because it has such bright & cheery colours and patterns 🙂 Besides -it was a huge paper stack! Even sharing the pack with one of my team members gave me tons of paper to use! I started with a small panel of Whisper White cardstock, and stamped the sentiment in Basic Black ink. 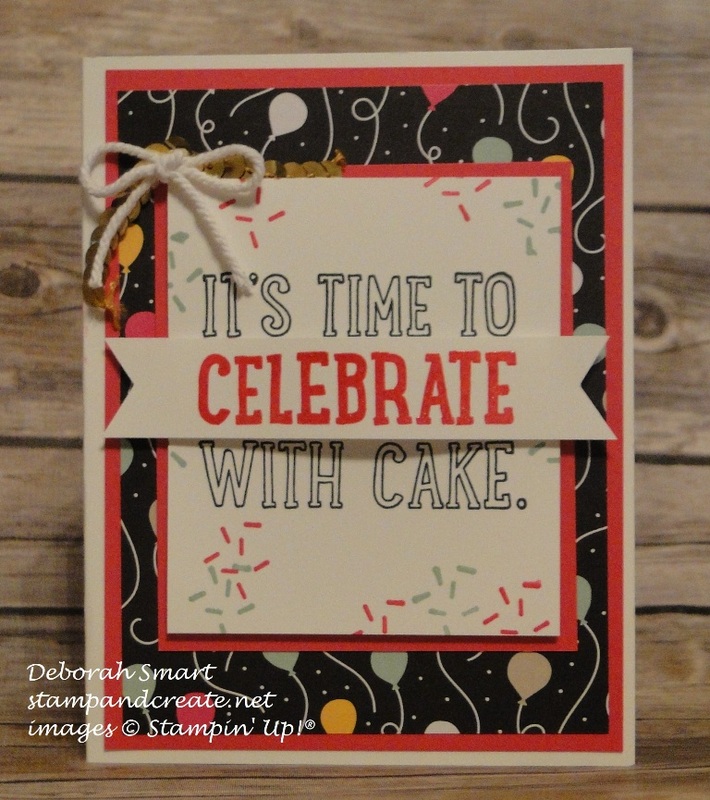 On a smaller piece of Whisper White, I stamped it again in Melon Mambo ink, then cut out just the word ‘celebrate’. I cut banner tails on each end, the popped it on top of the stamped word, using Stampin’ Dimensionals. I added some confetti around the sentiment, stamping in Melon Mambo and Mint Macaron ink. I then layered the stamped panel on top of a panel of Melon Mambo cardstock. Taking my Whisper White card base, I added a panel of Melon Mambo cardstock, then topped it with a panel of the balloon image DSP from the It’s My Party stack. To this, I then added my stamped panel, then added a length from the Gold Sequin Trim, and topped it with a bow of Thick Baker’s Twine in Whisper White. So – you’re wondering ‘ you said there was a fun fold – where is it?’. Well – it’s on the inside! I haven’t used my Party Pop-Up Thinlits in way too long – they are such fun!! I started by cutting a piece of Whisper White just a big larger than the Thinlits, then ran it through the Big Shot. It’s easy to get it centred on your cardstock, just make your centre score line, and there are little metal arrows on the thinlit for you to line up. After die-cutting, I then cut another piece of the balloon design DSP from the It’s My Party stack, so that it was the same size, then glued the die cut to the DSP, making sure to not glue down the parts that are supposed to pop up! I then repeated what I had done on the front of the card; stamping confetti in Melon Mambo and Mint Macaron. I then glued the pop up part to the middle of the card, and again added the string of Gold Sequin Trim, topped with a Thick Baker’s Twine bow of Whisper White. Finally, I stamped a sentiment on the bottom right corner inside the card, in Melon Mambo ink. 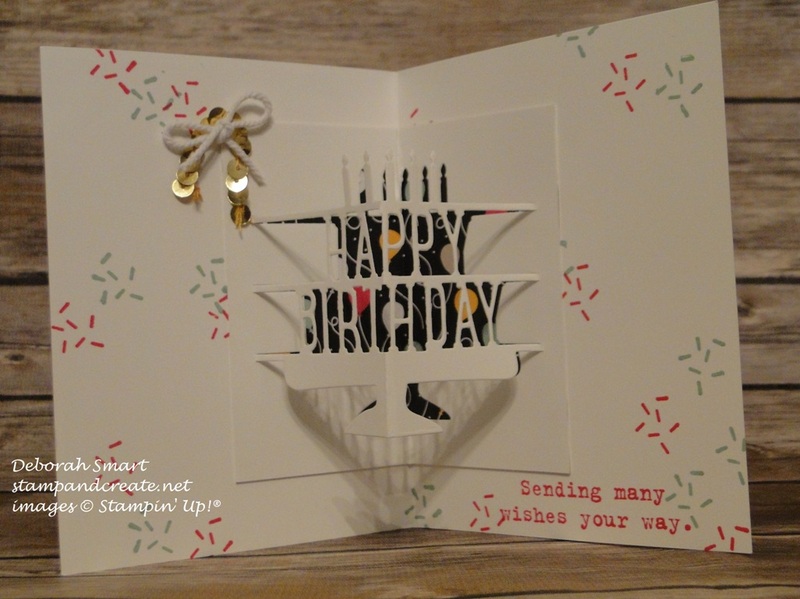 I think this card packs a party punch – and it’s pretty easy to do, thanks to the Party Pop-Up Thinlits! Let me know what you think – I always love reading any comments you would like to leave. Deb this is such a lovely card. Popping the word “celebrate” up the way you did really makes it special. What an awesome fun filled birthday card Deb. I like the way the surprise fold was on the inside! The DSP is just fantastic. I wish it would have lasted beyond retirement too, but I’m glad you reminded me I still have some to use up! Great card! Hope you’re feeling better this week. PS: I had no idea the PCC was doing a TIC TAC TOE this week too! What a challenge for you but you did both so great! Thank you, Penny! I really do like these Pop-Up Party thinlits – they’re so easy to use, too!